Today I went to a coaster painting session at Red Brick. All the artists associated with Red Brick are painting small tile coasters which will be displayed and auctioned as part of a fundraiser later in the year. 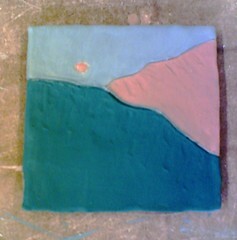 I made three little tile coasters today, all mountain images. I incised the image into the clay with a pointed tool, then painted with the glazes. I don't know how my little tiles will look once they are fired, and I may not find out for a month or two. But this photo shows what they look like right now. The goal is 100 coasters total for the group, and we are just getting started. I really had a good time, and hope to get to another coaster painting session soon. 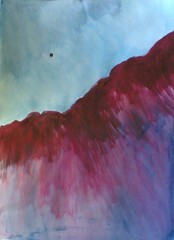 Here is another painting I have been working on: mountain imagery inspired by my home state, Colorado. This is acrylic used as water-media. 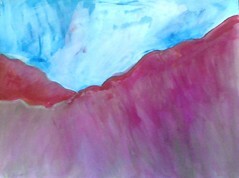 I added blues and purples to the sky, and some pale green washes to the foreground. I actually worked on this one on Wednesday at Red Brick, but it was still too wet to photograph well by the time I had to leave. Today I went to Red Brick again, and while I was there, I photographed it. 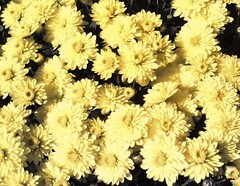 Yesterday I went to get my hair cut, and afterwards, I saw a big planter full of little yellow chrysanthemums outside. (My mom used to call these button mums.) I liked the bright yellow flowers, so I took a picture with my phonecam. Tonight I loaded the image into my computer, but the color seemed faded, compared to what I had seen. So I corrected the color a bit, then cropped the image to focus on the patterns that the blossoms make. 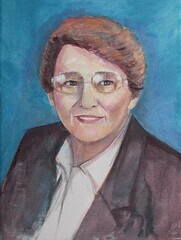 This is the portrait I have been painting for my friends, as it looks as of today. Yesterday I added details to the eyes and mouth, small changes to add expression. I adjusted the face shape just a tiny bit, and then began to tone down the blue in the background. I worked on this painting yesterday at Red Brick. 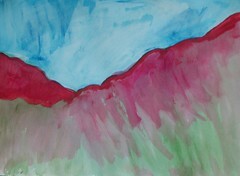 I added some color to the sky, and some dark blue washes to the mountains. This is how the painting looked when I was packing up to go home. 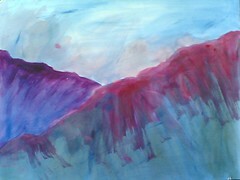 This is a work in progress, a painting inspired by the Rocky Mountains. I am using acrylics as watermedia painting. 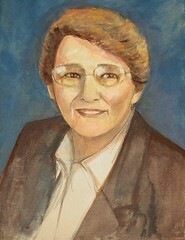 This is the painting as it looked after two painting sessions at Red Brick. To be continued. . .
On a recent walk, I noticed that hydrangeas seem to be everywhere, and right now, most of them are beautiful shades of pink and cream. They make it look like spring in September! 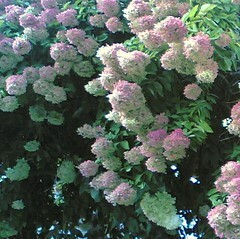 I love the way the flowers look hanging from the branches, so I took some pictures with my phonecam. Tonight I did some cropping to get the composition and colors right in the photos. This one is the best of the bunch, I think. 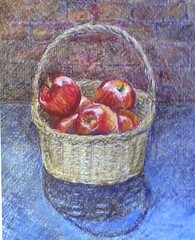 Last week, I was working on an oil pastel, a still life of apples in basket, and as I worked on it, posted it as a work in progress. Today I used the finished piece in my e-mailed greetings for the Jewish New Year. This is the photo I took of the apples when I started the drawing, because I wanted to have a photo to use as a reference for the still life in case I couldn't get to Red Brick on a sunny day or at the right time for the light. 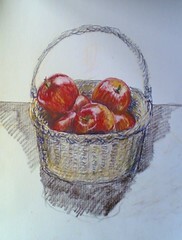 Well, the drawing is finished, and the apples were taken home and have been eaten. But I still like the photo for its own sake, and as a bonus, it provides a little peek into my studio space at Red Brick. 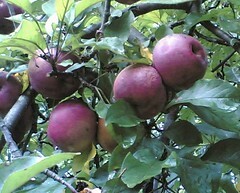 I decided to crop the photo and post it here today because it makes a nice image for Rosh Hashona, when everybody eats apples with honey for a sweet year! 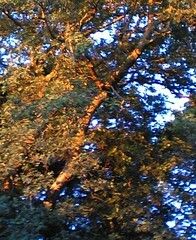 Here's another recent attempt to capture the golden light of September in the late afternoon. The light is amazing but is it possible to do it justice? 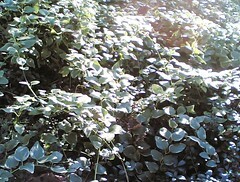 I used my phonecam to take this photo of vinca vines in the sunlight. Aside from cropping just a bit on the left, this is the image as it came out of the camera. I love the light in September, and late in the day (or early in the evening) you can see great long shadows and yellow light hitting the trees. I took this picture around dinner-time, using my phonecam. Late this afternoon I took my paintings up to Manchester, New Hampshire, and set up the show so it can be hung tomorrow. Later, I had a chance to walk around the old mill area just as it was beginning to get dark. 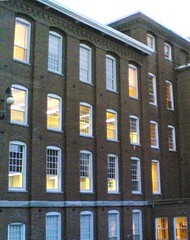 I like the pattern upon pattern in those old brick mills, and the yellow light in the windows, so I took a picture with my phonecam. When I got home, I rotated the image to get the windows lined up, then cropped the image to get the composition the way I wanted it. I didn't have time to paint today, but I did spend some time dealing with this painting! 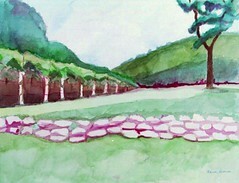 This is a watercolor of Portugal that I painted a few years ago. In fact, it is one of the first of the series. (I take photos during my visits, and then later, base my watercolors on those photos.) Tomorrow evening I am going to Manchester, New Hampshire, to hang a show of my watercolors of Portugal. But just last night, I saw that the glass on this painting was cracked, so this morning I took it in for a quick glass repair and just picked it up a few minutes ago, right at the five o'clock traffic rush. But now I will be able to hang the whole set of twelve paintings tomorrow as I had planned. The weather has been warm for the past few days, and we have been making the most of it, including a recent excursion to Long Hill Gardens for a walk, followed by a side trip to Meadowbrook Farms, a great little open-air market. 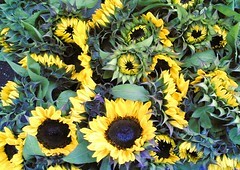 That's where I saw bunches of sunflowers for sale, so I took this picture with my phonecam. Tonight I adjusted the color and cropped the image to get the composition I wanted. 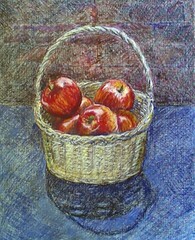 Today I added a little more color to the basket, and then did more work on the background. I added more warm colors to the brick at the top left corner to suggest light, and added light to the table surface as well. I decided this is finished enough to sign, and enough to take the apples home to eat! Next week, I am going to include this image in Rosh Hoshona greetings for friends and family. This morning I spent another hour working on this drawing made with oil pastels. I am trying to work on this around the same time every day so I have the same light. I worked a little on the apples, but most of the time worked on the background. For about fifteen minutes, there was very bright sun, so I had a chance to work on the shadow. I left the apples in the studio so I can go back and finish this in the next few days. I went back to Red Brick this morning to work on this still life. Apples don't last forever! I meant to stay for just an hour, but I was there a bit longer. First, I worked on the basket, checking and correcting the position of the elipses, and then added detail and some color. I also adjusted the position of two apples to improve the composition. I decided to use the studio's brick wall for the background and sketched in the pattern of the bricks, and then started to add some color. It was so much fun working on the background that I lost track of the time. It was a cloudy today, but when the sun came out for a few minutes, I noticed some interesting patterns in the shadow cast by the basket. It was hard to stop drawing today, but I can go back tomorrow morning. . . This is a work-in-progress. 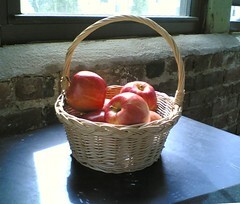 This morning I took some apples with me to Red Brick to use for a still life. 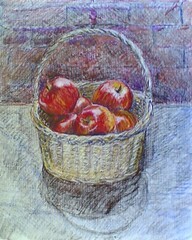 I used the short time I had to sketch the apples with oil pastel, and then worked on the basket. Tomorrow I hope to work on this some more, but just in case the light changes, I also took a photo of the set up for reference. I like to draw apples this time of year. This is a small painting that I started last week. This is a work in progess. I wouldn't usually start a painting like this with yellow, and I didn't like it at all until I added some pink. Then the sunny colors made me happy. To be continued. . . In July of 2001, we drove to NYC from Boston for the weekend. We used to go to NYC quite often when we lived in New Jersey, and we wanted to do something different. My cousin suggested we take the subway to Brooklyn and walk back over the Brooklyn Bridge. The view of the New York skyline was great, but of course, I was concentrating on the Brooklyn Bridge. But it turned out that this was really my last look at the NYC skyline with the World Trade Center. It also turned out that a few months later, on September 11th, many people had to walk over the Brooklyn Bridge in the opposite direction to get home. 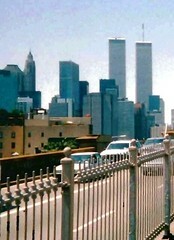 Tonight I found an image of the Twin Towers in a photo Mel took that day, so I cropped this image out of the background. I opened the image in Painter IX and posterized it to soften it just a bit. I'm glad we decided to walk over the Brooklyn Bridge, and glad to have a picture of the World Trade Center on a happy day. 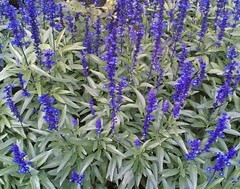 I saw these flowers on a late afternoon walk and took a picture with my phonecam. I liked the way the purple flowers looked in the low light of a September afternoon. Today I worked on this portrait that I am painting for my friends. I made some adjustments to the shape of the face, and made changes in the line of the shoulders. I also added more light to the face and more detail to the hair. This is the latest version of one of the paintings I have been working on. I added some more washes of color, including more pink in the sky to suggest clouds. I don't know whether or not I am going to do more with this one . . The other day I passed the garden shop on my morning walk. Most of the flowers in front of the shop are mums. 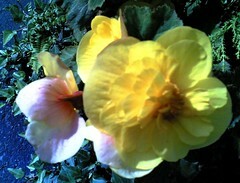 But there was one pot of bright yellow begonias that attracted my attention, so I took a picture with my cameraphone. Tonight I cropped the image to get the composition I wanted. I noticed some marks on one of the leaves that were distracting, so I opened the image in Painter IX and used digital pastel to clean up the leaves. Here is the painting after the third session. I added some light and dark washes to create a little more depth. I am never certain, but I think this is the final version. 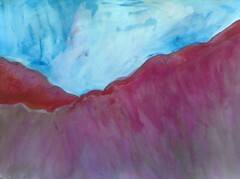 This acrylic watermedia painting is a work in progress, inspired by my recent trip to Colorado. This is how it looked at the end of my second painting session. I added pink washes to the foreground to tone down the green, and also added some pink to the sky. The color is not realistic (I am working from memory and imagination), but the Colorado mountains really can look pink at certain times of the day. And when the sun rises and sets, it sometimes glows red in the sky. Here is another work in progress. This painting is done with acrylics used as watermedia. 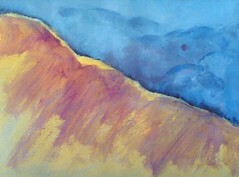 The image is from imagination and memories of the Colorado mountains. 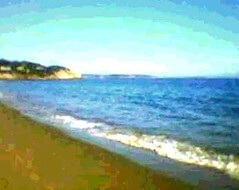 This began as a photo taken with my phonecam last year at Singing Beach in Manchester-By-The-Sea. Tonight I rotated and cropped the photo, then opened it in Painter IX and used the posterize effect to create this image. Tomorrow marks the end of summer, but not the end of beach days if you live around here! But I am posting this image today because I finally had a chance to see "Painting New England in Summer," a terrific show at the Peabody Essex Museum. It was a gorgeous show, with a lot of surprises, but I especially enjoyed seeing all the different ways of painting the ocean. Yesterday I had a chance to do a little more with this collage. 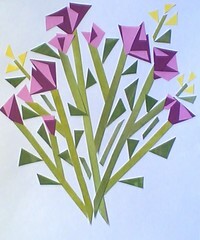 I added more leaves and some yellow flowers, for contrast. 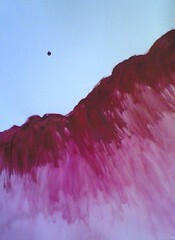 This is one of the paintings I have been working on this week. This is done with acrylic paint, used as water media. This painting is still a work in progress. 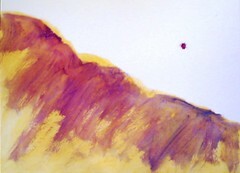 I began with one hill, outlined in pink. I decided it needed a second hill, so now it is two hills, and there is as much blue as pink. I guess even the title is a work in progress. . .